Bloody hell, hope your family are alright, are they planning on staying on the island? Latest update show Joaninha is currently undergoing explosive intensification and it's currently gusting over 140kmph at sea. 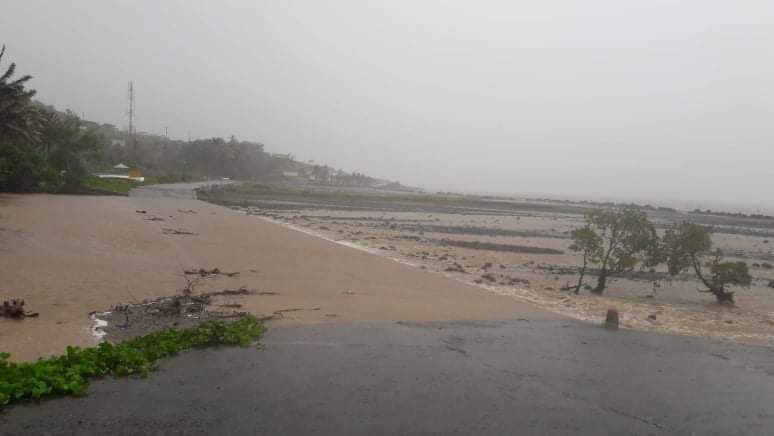 Joaninha has been making a very slow movement towards the south south west at around 5kmph, it has been stationary during the day while gathering strength. Now it's currently gusting over 150kmph over sea. 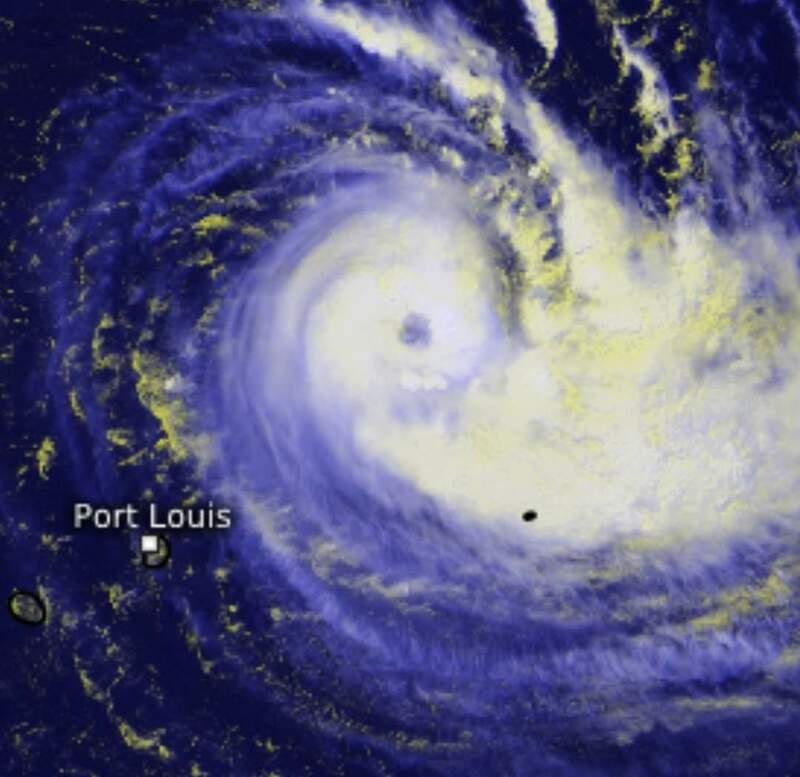 Joaninha is approximately 390km North of rodrigues and is expected to pass over the island on Monday night. 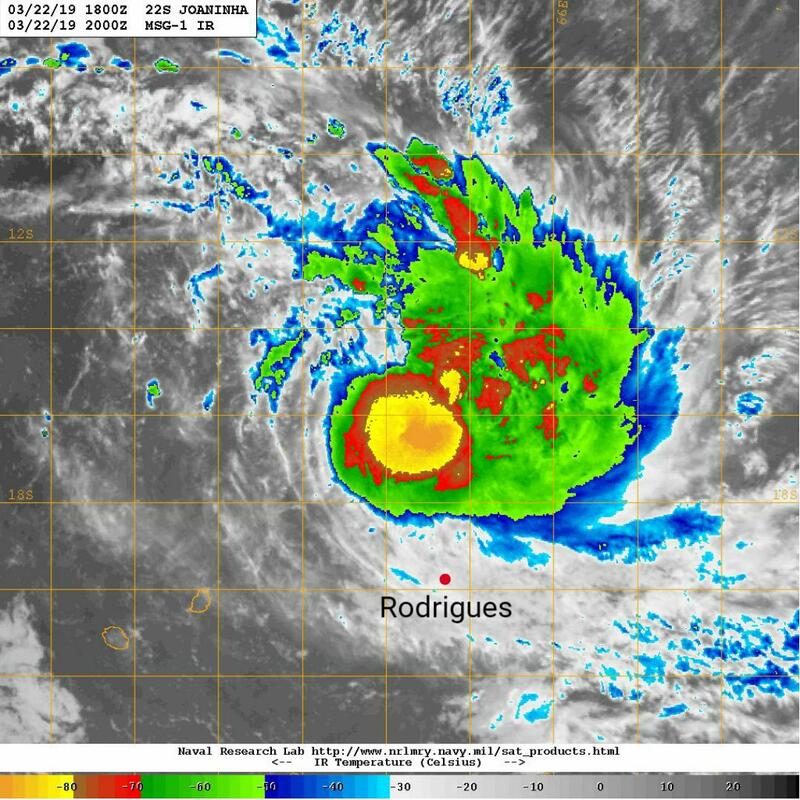 Models are still projecting a direct hit and if that's the case rodrigues will experience a lull for around 3 hours as the centre passes over the island. Joaninha is now a Tropical cyclone ( cat 2). It has remained almost stationary during the last 12 hours. 0600 hours it was still located at a distance of about 370 km to the north-north-west of Rodrigues, in latitude 16.9 degrees south and longitude 61.6 degrees east. The central pressure is estimated to be around 970 hPa and gusts near the centre are of the order of 170 km/h. 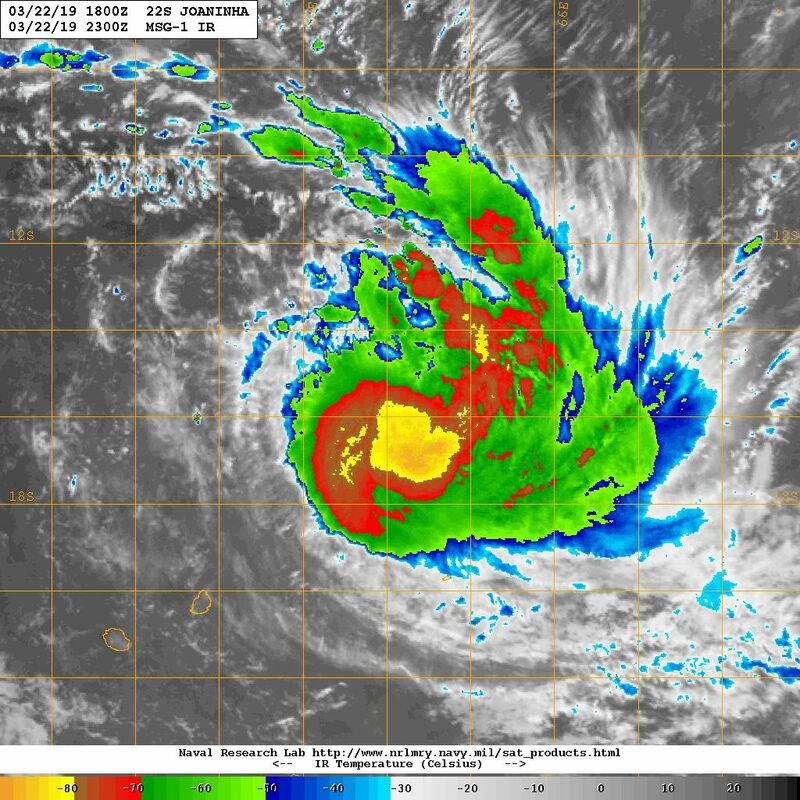 At 0600 hours, the tropical cyclone Joaninha was centred at about 230 km to the north-north-west of Rodrigues, that is in latitude 17.7 degrees south and longitude 62.4 degrees east. It is now moving towards the south-south-east at about 05 km/h. The central pressure is estimated at around 955 hpa and gusts near the centre are of the order of 200 km/h. 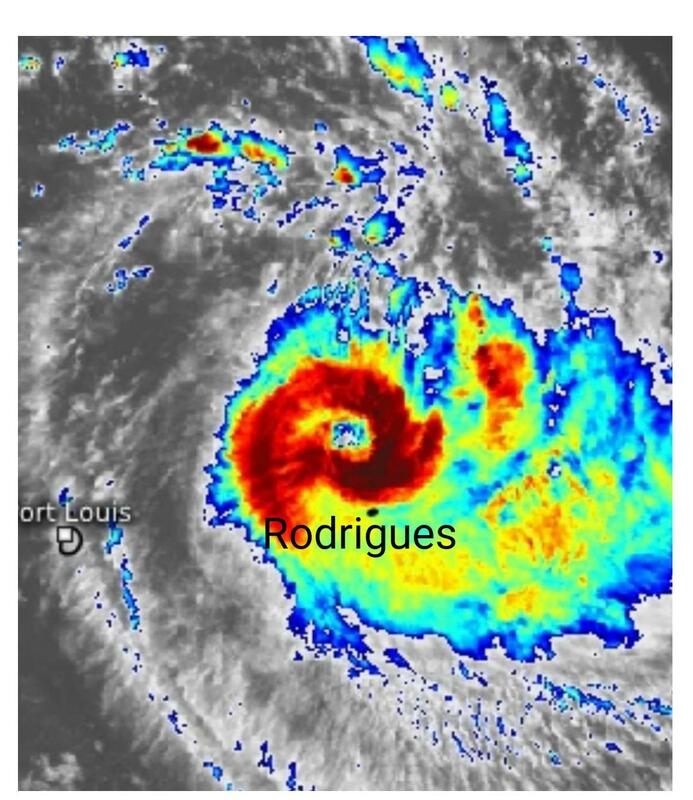 Rodrigues will start feeling cyclonic conditions as from this afternoon. I really hope your family are safe Yansno, and that the island is not hit as badly as forecast. 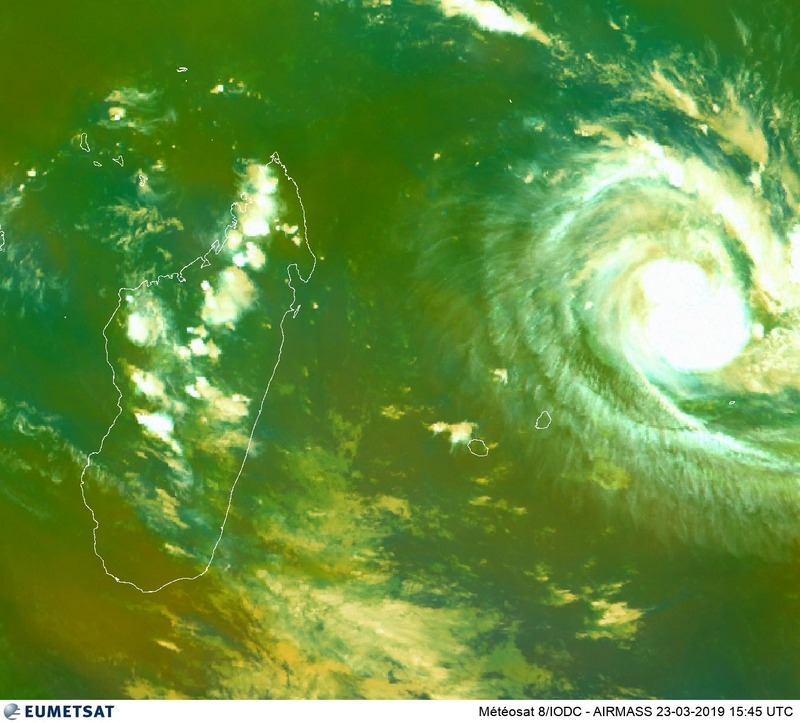 And it has begun, recent observations show that gusts higher than 120 km/h are being recorded at Rodrigues. The highest gusts recorded so far are 137 km/h at Montagne du Sable and 122 km/h at Pointe Canon. Cyclonic conditions now exist at Rodrigues, highest level 4 warning is currently in force. Current estimated distance is around 200km North of the island. Cyclonic conditions are prevailing over rodrigues island and may last until tomorrow afternoon. Intermittent rain will persist and will cause water accumulation and local flooding. The sea is phenomenal with heavy swells causing floods of low-lying coastal areas. Montagne du Sable: 144 km/h. Montagne du Sable: 158 km/h. Last edited by YanSno; 25-03-2019 at 17:07. Latest satellite observations indicate that Joaninha has intensified into an Intense Tropical Cyclone . 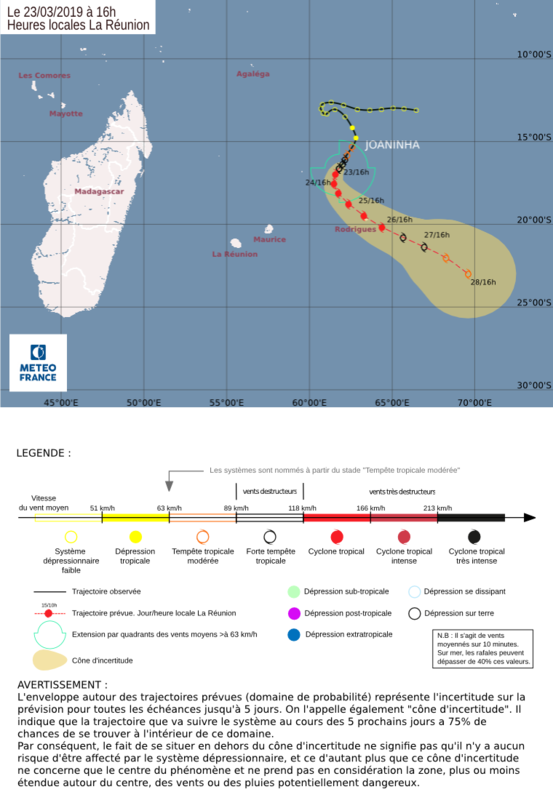 Furthermore, barometric pressure at Pointe Canon and Plaine Corail Meteorological Stations is now falling rapidly which indicates that Intense Tropical Cyclone Joaninha is dangerously coming close to Rodrigues. 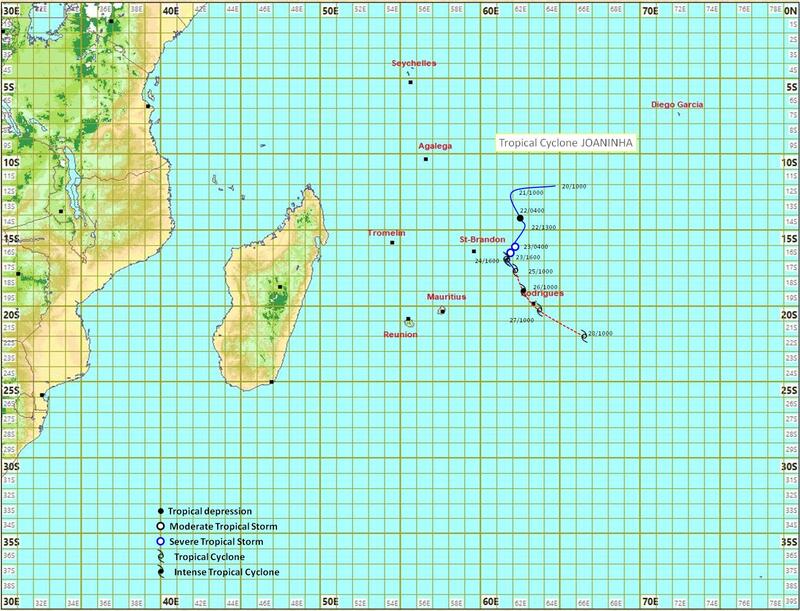 At 2100 hours Joaninha was centred at about 110 km to the north of Rodrigues, that is in latitude 18.7 degrees south and longitude 63.6 degrees east. 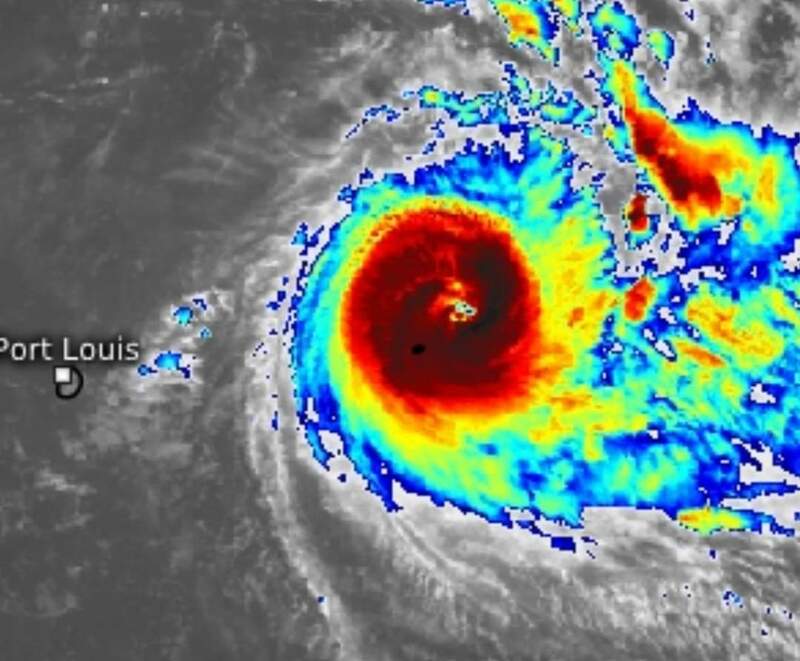 It is now moving towards the south-east at about 10 km/h and it is expected that it will pass at its closest distance of about 30 km to the north-east of Rodrigues around mid-day tomorrow. Gusts near the centre of the cyclone are estimated to be around 225 km/h. Last edited by YanSno; 25-03-2019 at 21:31. 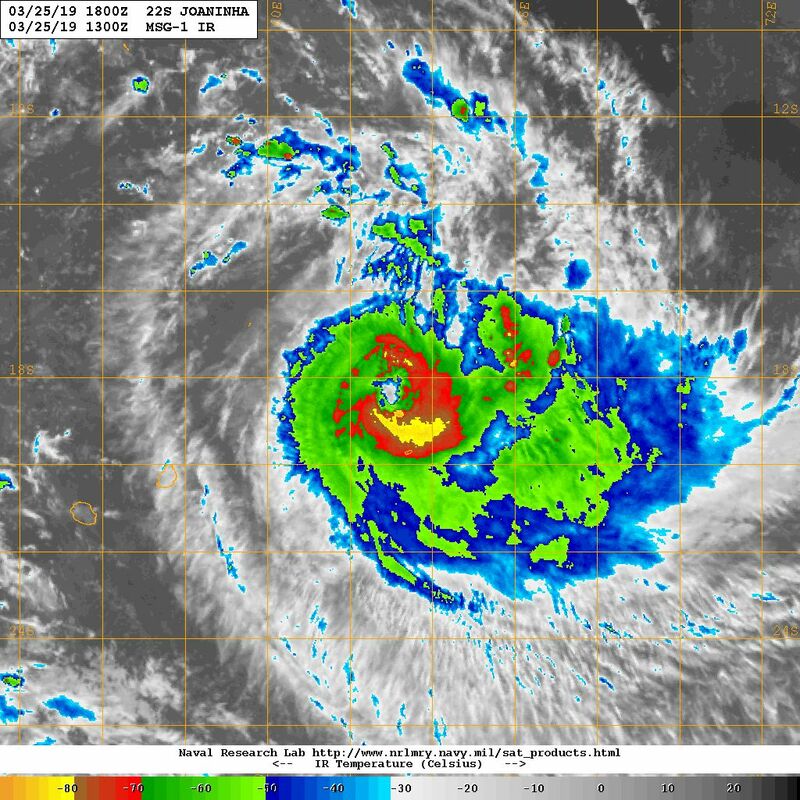 The latest observations from Rodrigues indicate that the Intense tropical cyclone Joaninha is passing at its nearest point from the island. At 0600 Hours it was centred at about 70 km to the north east of Pointe Cotton, that is in latitude 19.1 degrees south and longitude 64.1 degrees east. It is moving in a general southeasterly direction at about 10 km/h. Gusts near the centre of the cyclone are estimated to be of the order of 250 km/h. Hopefully your family are ok and in shelter. I don't know how I'd be if it were my family. Let us know how they get on. I'm praying for them. Thank you for caring. The good news is that they are all fine and lastest update shows that barometric pressure is slowly rising which means the cyclone is moving away. It's has been a scary 24 hours for them as they described . 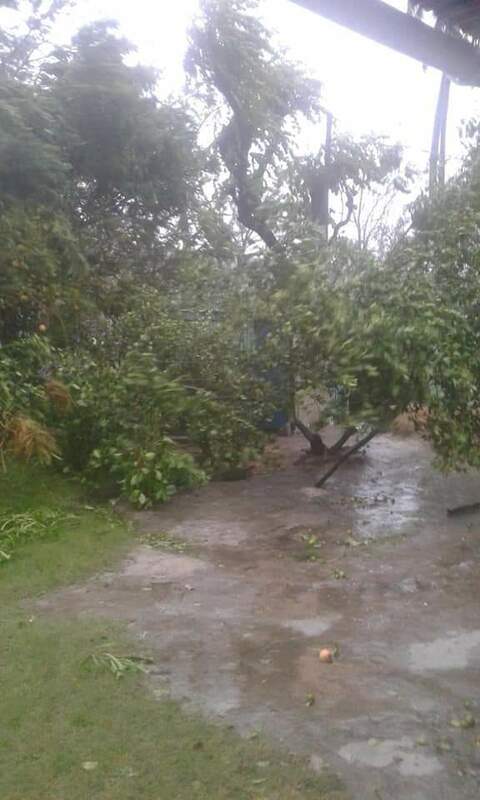 They have no electricity nor water, community centres are open providing them with basic needs in case of emergency, authorities has advised not to venture outside as cyclonic conditions will still prevail until the afternoon. It's still currently gusting around 140kmph. I will update with images later on.